This is probably one of the most fun posts I’ve ever done, and I’m so excited to share these amazing photos by Magic Moments Photography with you all! 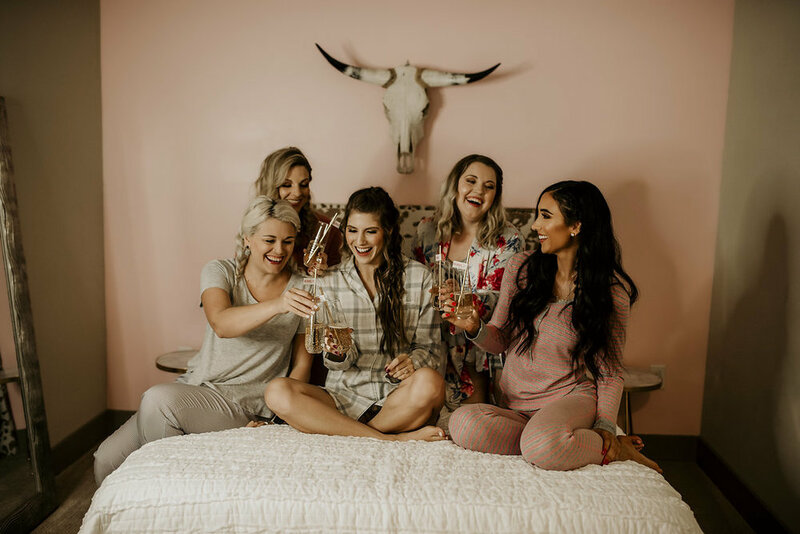 When Holly reached out about doing a styled Bachelorette Party shoot at our Airbnb, The Nashelorette, I jumped at the chance and I’m so glad I did! It was so much fun working with these amazing ladies (who all happen to be wedding vendors themselves!) to bring our ideas to life! First off, let me introduce everyone! From left to right: DaNae is an amazing hair stylist who got everyone’s hair photo ready! Abbey is a fellow blogger, who also owns a store, The Perfect Little Store! She provided all of our fun props, the “bride” sash, and also made the amazing balloon installation behind us! Aaron is the owner of Memory Lane Events, a wedding and bachelorette party planning company that can help you with any and all of your wedding planning needs! Cydney is an amazing makeup artist, and she did all of our eye makeup for the shoot! And then obviously Holly isn’t pictured, but if you’re in need of a photographer you absolutely need to check out her gorgeous work! I have been waiting for an opportunity to wear this gorgeous dress courtesy of Chicwish, and it was absolutely perfect for this shoot! I am seriously obsessed with this dress, and think it would be perfect for a bachelorette party, bridal shower or rehearsal dinner! It’s also super reasonably priced at under $70! Doing this shoot made me realize that one thing I really want to do at my actual bachelorette party is hire a photographer to come take pictures for an hour or two! 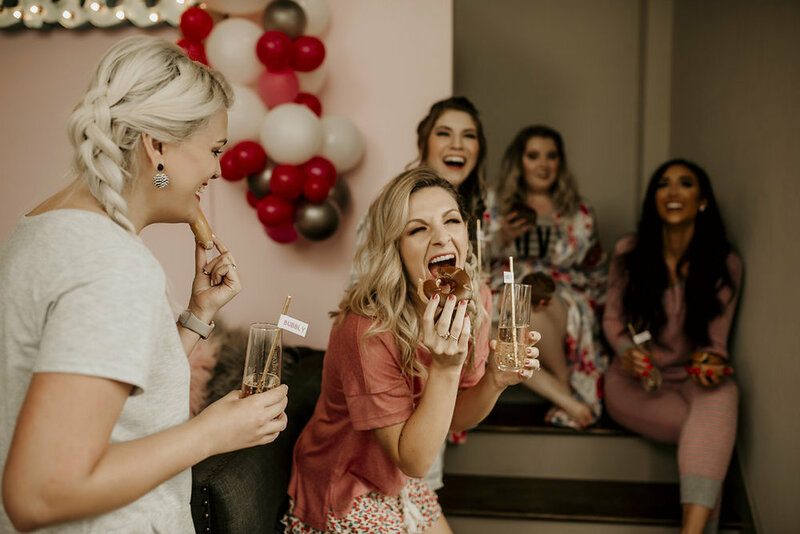 I just LOVE how these pictures turned out, and think that it would be so cool to have those memories captured at my actual bachelorette party! I especially love how our PJ and breakfast pictures turned out! 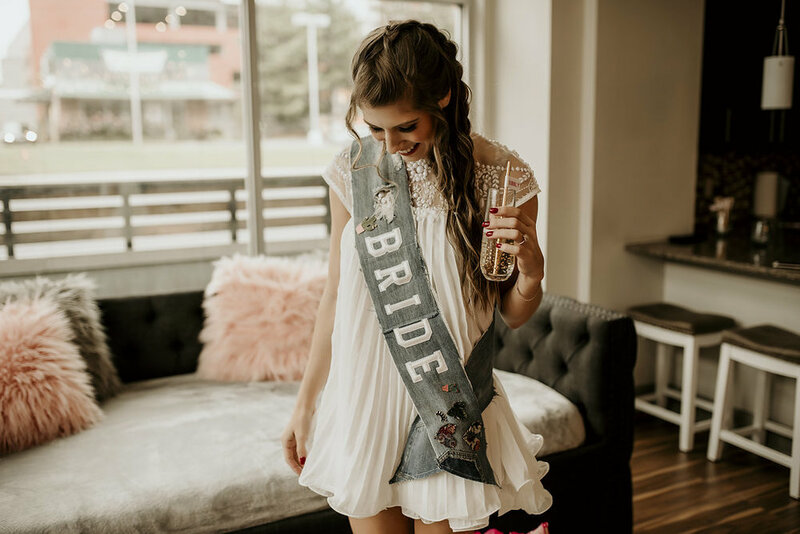 This shoot was so fun to put together, because obviously my own wedding and bachelorette party are definitely on my mind, so as I was planning it I was thinking about the things that I would want for mine! Here are some things that I haven’t seen a ton of people do, but that I think would be so fun! 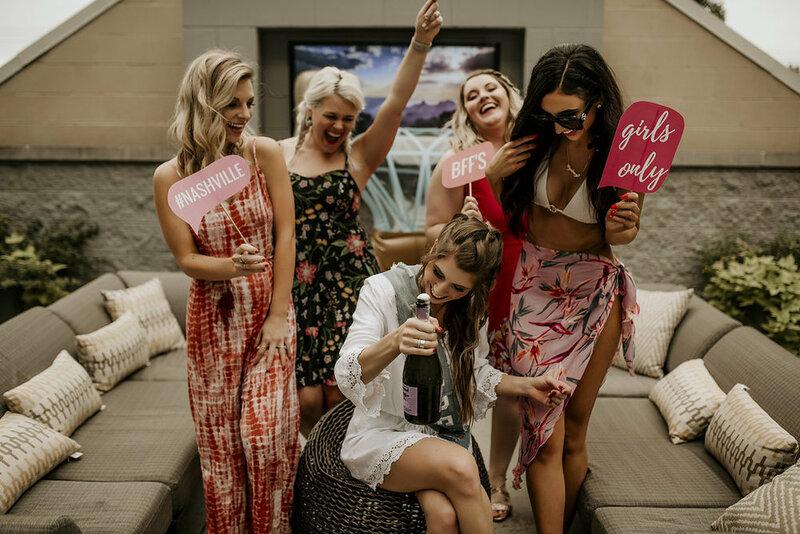 Hire a Photographer: I absolutely love these pictures, and after seeing them and how well they turn out I know I definitely want to hire a photographer to come by and get some fun shots of my actual bachelorette party next year! I think that it would be so great to have those pictures to look back on, and also think that a framed bachelorette party picture would make a personal and unique gift for your bridesmaids! Put together a cute home brunch: Yes, going out to brunch is fun, but I actually think it would be more fun to do brunch and mimosas at home/your Airbnb or hotel! A, you don’t have to change out of your PJ’s which is a HUGE plus, and B, you will save SO much money, especially when it comes to drinks! Why spend $10/drink at a restaurant when you can get an entire bottle of sparkling wine/prosecco/champagne for $7-10? My favorite budget sparkling wines are the Kirkland brand one from Costco and the Trader Joes brand one! Both are only about $7, so you can save your money for fun activities later! 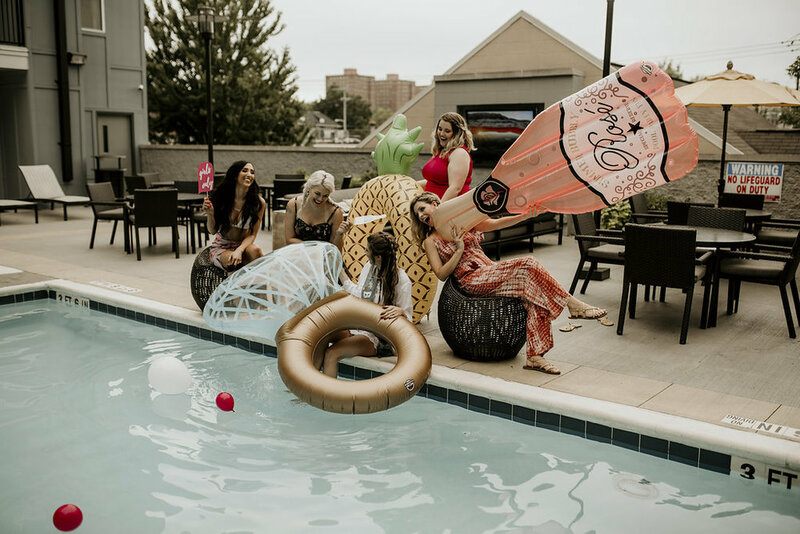 Stay in an Airbnb: Hotels are great, but if you really want to personalize your experience, check out the Airbnb’s in the area that you’re looking to have your bachelorette party! I love Airbnb’s because unlike hotels, they usually have way more in the way of amenities, such as a full kitchen, which can save you so much money! Also, if you have a larger group, it’s easier to find an Airbnb that fits everyone than it would be to find a hotel! Just remember that when staying in an Airbnb it’s important to be respectful and treat it as you would treat your own home! Do you have any fun bachelorette party tips or ideas? I would absolutely love to hear them! I also do eventually plan on putting together a second post talking all about things to do in Nashville for a Bachelorette party, so if there is anything you did here in Nashville that you LOVED I would love to hear all about it! Special thank you to everyone who made this shoot so amazing! Be sure to check out their pages, I’ll link them all again for you below!